"BAND ISN'T FUN ANYMORE!" This is the clarion call of late September. Gone are the fun-filled days of band camp where team building and bonding activities were paramount and smiles were aplenty. The energy of new faces, new music, and new drill have been replaced with the drudgery of cleaning the opener while simultaneously trying to get the ballad on the field and teaching the closer. The repetition and drudgery associated with daily rehearsals are starting to take their toll, but the energy and enthusiasm associated with contests and competitions are a ways away. Add to this homework, tests, jobs, and the other responsibilities associated with being a teenager, and your students might be right... Band might not be fun anymore. Here's a secret:It’s not supposed to be fun. It 's supposed to be meaningful and memorable. Don't get me wrong, music brought me more joy than any other of my high school or college experiences. It connected me with quality friends, gave me opportunities, and created memories that have had a profound impact on my life. But, these moments and weren't always FUN! You know what I remember about band? I remember being so hot that I thought I was going to die, but running back to my spot anyway. I remember being so exhausted for early morning rehearsals, but crawling out of bed anyway. I remember being so sick of marching and playing the same three songs each and every day, but playing and marching them again anyway. I remember those things like they were yesterday. I remember the good, the bad, and perhaps the most important part, the people I shared it with. Perhaps you could have your students take just a minute and write down some of their favorite memories from their band experience. This will hopefully help to remind them that the difficult times are a part of what makes this activity so special. In fact, the experiences that had the greatest imprint on my life, were the ones that made me work and persevere through difficult times and arduous moments. Keep in mind that FUN times make us feel good, but the "BA(n)D times teach us to BE good. When choosing between "feeling good" and "being good," it is often the latter that does the "most good" for our lives. 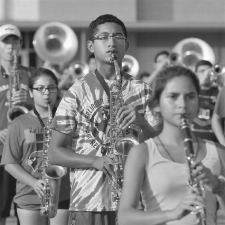 Yes, I remember band, and it wasn't always fun! You know what band is? Band is worthwhile. Band is life-changing. Band is working hard with the same people, fighting through the bad days, and celebrating the good ones together. Band is memorable.Band is family. Band is sleepless nights and never-ending days. That’s what band is. And I remember it like it was yesterday, because it taught me to BE GOOD! Recent tragedies, coffee, and collaboration!